Not golf ball sized, but pretty dang big. Growing up on Canada’s East coast I had heard stories of the storms of golf ball sized hailstones that sometimes fell out in the prairies. 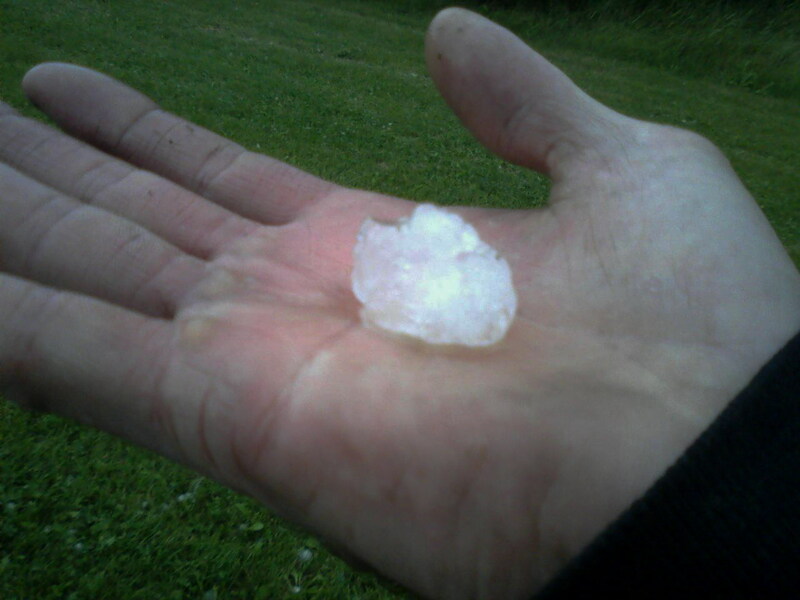 This sounded dramatic as the largest hail I ever saw on the coast was about the size of a grain of rice. 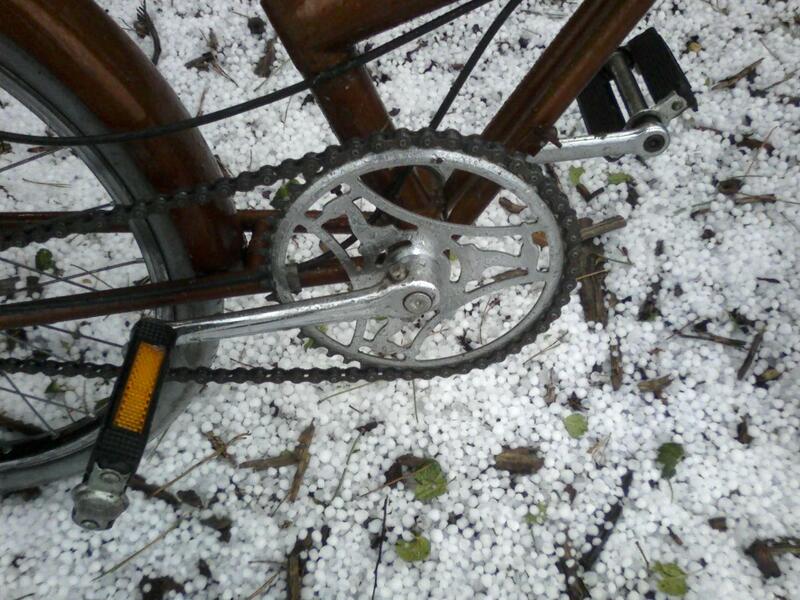 Since then, in the decade or so I’ve lived in Alberta, I’ve seen a few decent storms with pea sized hail. Last Thursday I was “treated ” to the most impressive downfall to date. Towards the end of my workday ominous looking clouds implacably rolled over the city. In a remarkably short time the sky darkened until it looked like nightfall, dark enough that our building’s outside lights switched on. The radio announcements of a severe thunderstorm warning seemed gratuitous. Not much work was getting done as we milled about peering at the sky. I was hopeful that the storm would break before I had to leave for home as I didn’t relish the idea of getting caught in it. The storm was intense and short. We had closed all the big doors as the winds started gusting and shortly after there was the deafening din of the hail pummeling the building. Although I watched it from the comfort of secure shelter I’ve spoken to a few people were caught outside. Not fun. On the bright side, they get some serious bragging rights. Within half an hour the downfall had settled in to a light steady rain. This was a much better situation for cycling home in. On the way home I snapped a few pics. As luck would have it, I had forgotten my good camera and was forced to use my antique cell phone. Fortunately, I had filled the phone’s hopper with coal and the boiler was whistling nicely (soon I will upgrade to a newfangled internal combustion phone). 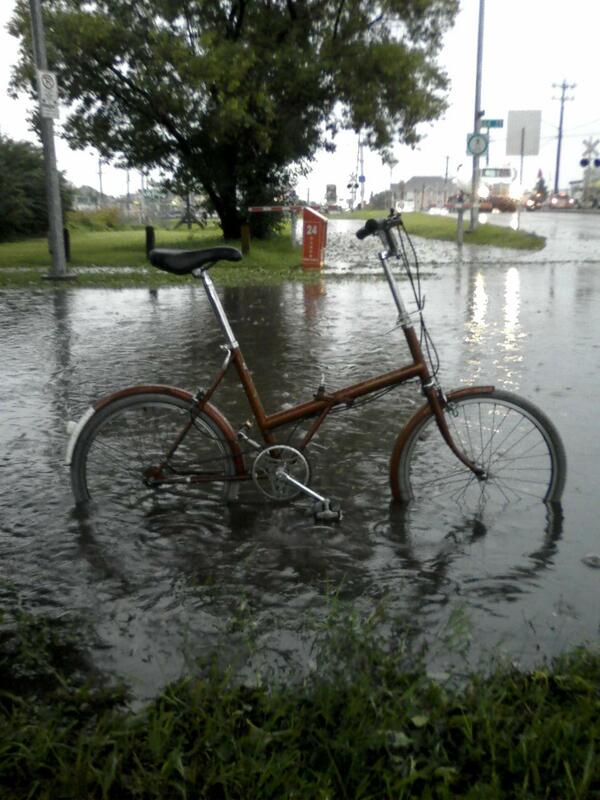 I was pleased that the Raleigh 20 handled the rain, fallen debris and flooded roads with aplomb. I like this bike more each time I ride it. Branches and leaves battered to the street by the hail clogged the storm drains. Once at home I discovered the house to be intact but the garden mostly flattened. Most disappointingly, almost all the apples had been knocked from our trees and were looking very bruised on the ground. This was a sore blow to our great cider making plans. All in all, not the worst storm of my time in the prairies, but definitely the largest hail. I popped a few of the bigger stones into my mouth and crunched them. I assumed they would imbue me with the strength a of thunderstorm and a heart as icy as the hail. I will let you know how this works out. Tuckamoredew and R20 go to folk fest. 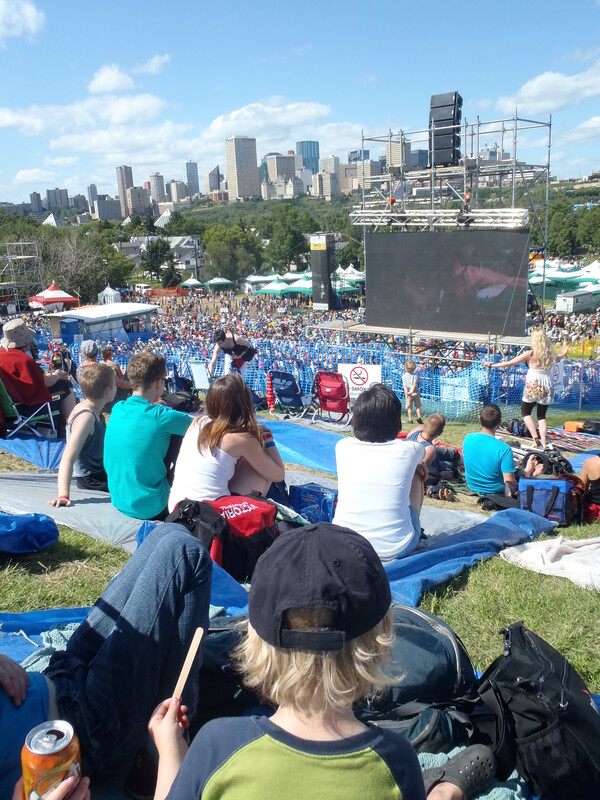 Of the some 90,000 people who walked through the gates at this past weekend’s 33rd annual Edmonton Folk Music Festival a lot of them arrived by bicycle. 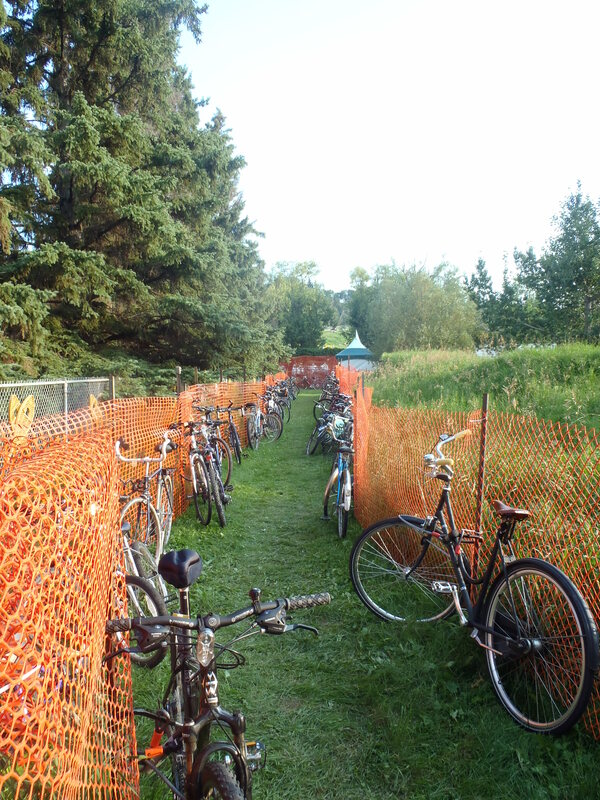 Each time I was there the volunteer supervised bike lock up was jammed to capacity with bikes. One of the volunteers told me that there were 900 bikes in the lock up at that time and I have no idea if that represented the peak use. 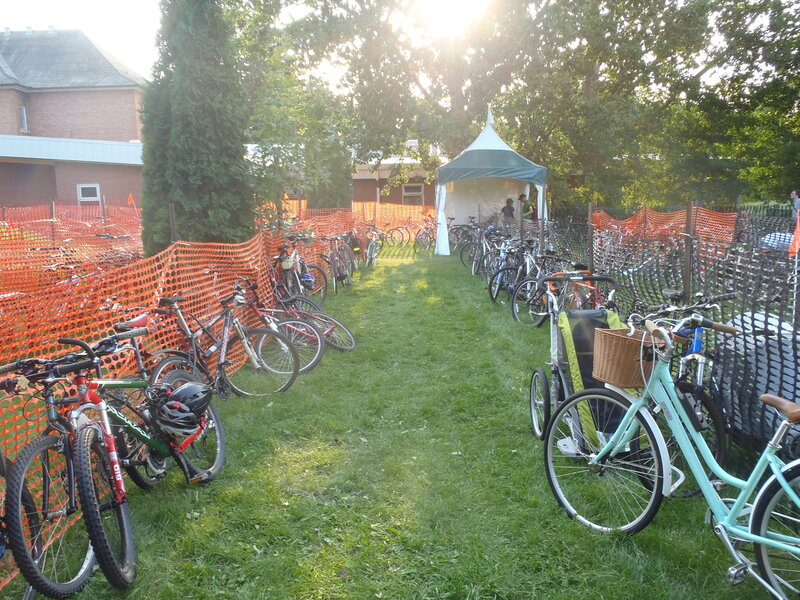 In addition to that, the streets surrounding the festival grounds were lined with bikes locked to every imaginable stationary object. 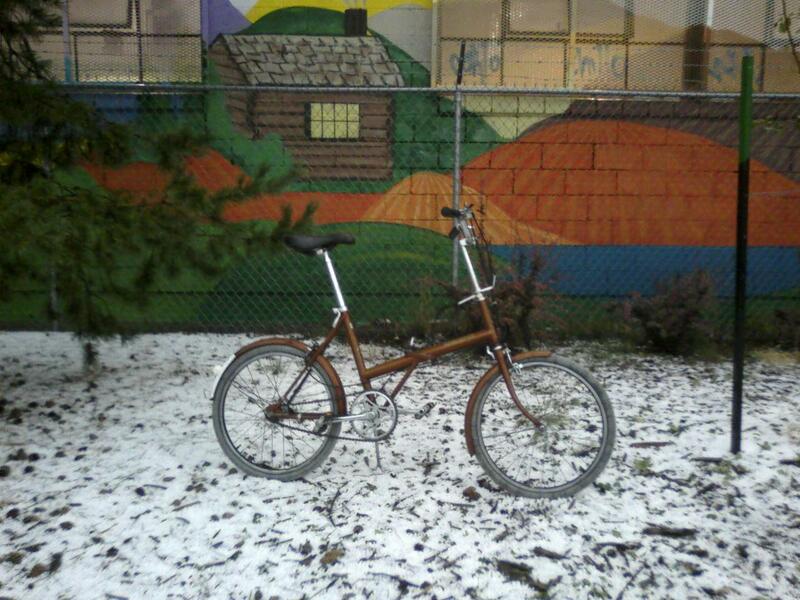 I’d have stopped to take a few more pictures but I was afraid that somebody might sneak up and lock a bike onto me. And, oh, the bikes! The variety was fantastic. This may be the hands-down champion Edmonton event for ogling bikes . 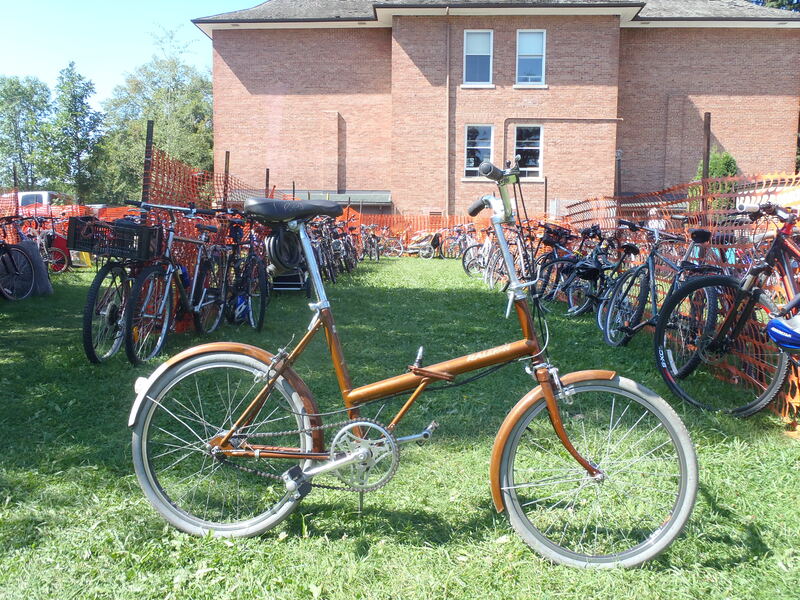 There were humble bike shaped objects, swarms of nice new bikes and hosts of stylish vintage bikes. I regret that I am unable to offer more than a handful of photos as I was a man with a musical mission this weekend ( and I was also wrangling my energetic 4 year old son). However, I can report that that a good number of manufacturers, past and present were represented. To name but a few: Kona, Rocky Mountain, Trek, Norco, Giant, Raleigh, Nishiki, Miyata, Peugeot, CCM, Brompton, Surly, Marinoni, Bianchi, Arvon, Cannondale, Specialized, Bobbin, Pashley, Linus, Dahon, Kuwahara, Apollo, Devinci. These are just a selection that I can immediately recall. I know that there were more. Oh, there was also music. Although this blog has been almost exclusively about bikes I did originally intend to write about music as well. 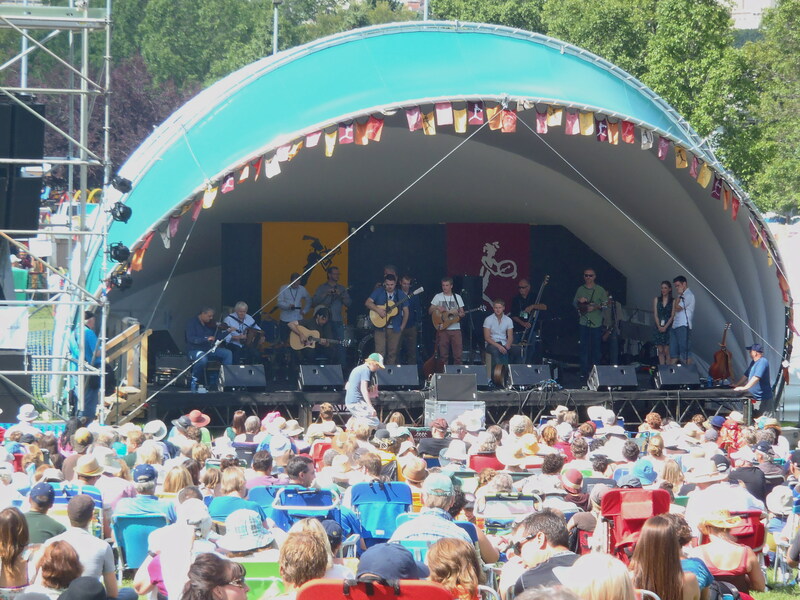 The festival runs for 4 nights and two days with six smaller session stages and one big main stage. That equals a lot of music to sample, scurrying back and forth between performances. Often, the great dilemma is to decide which one to attend. Sadly, my parental duties prevented me from spending every waking second soaking up music. Nonetheless I did hear some great performances and, as always, discovered many new artists. There were several concerts where the artists passed the goosebump test. That’s when the music is good enough to give you goosebumps on a hot summer day. This is one of the “smaller” session stages. There are 4 bands up there. Usually they take turns playing but more often than not some spectacular collaborations take place. Mainstage is hidden behind the big screen.That didn’t much bother me as I am usually not interested in the big name headliners that perform mainstage. For me, the real action happens on the session stages. You can somewhat see in this picture the natural amphitheater that results from having the festival on a ski hill. Finally, my favourites this year, with few videos (although not from the Edmonton Folk Fest). Martin Simpson. Spectacular fingerstyle guitar playing with both traditional songs and newer compositions. I have several instructional videos by Simpson and I really should buckle down to work and study them. The Mairtin O’Connor Band. Top notch Irish trio: Fiddle, accordion and guitar. The guitar player Seamie O’ Dowd formerly played with Dervish and I had seen him play several times before. Absolutely excellent musicianship from all the players. La Bottine Souriante. Iconic french-Canadian ensemble, once described as the “best band in the world”. This may be hyperbole but they are very, very good and you have to see them perform live to feel the energy of their music. I saw them perform once before a decade or so ago and they still deliver the goods. This video of clips is a good representation of their live show.